The DJI Phantom 4 Advanced drone is a no joke product with a no joke price tag. This isn’t for messing around with your friends on a hike. This is for taking quality photos and videos, and for enjoying a sophisticated survey of the world from the sky above. It is quick, it has a great battery life, high-quality sensors, and an excellent camera. In short, it seems like DJI is doing everything possible to earn the price tag that they have attached to this unit. The hardware and the software work in union to provide a user experience quite unlike what you find in the lower end of the price spectrum. Today, we aim to expand upon the features of this drone in order to better inform your buying experience. The design of the Phantom 4 Advanced drone is essentially similar to what one would anticipate. There are four propellers—one for each corner, which extend out from the central hub of the drone via short arms. The camera hangs below the unit and there are “legs” for the drone to land on so that the camera doesn’t come into contact with the ground. There are also sensors located on each arm of the drone, as well as in several places throughout the body. These sensors are designed to ensure that the drone does not come into collision as it flies. Even basic drones usually include a feature of this nature but the DJI Phantom 4 Advanced does take things to the next level. The sensors are able to detect obstacles from up to thirty yards away which truly minimizes the risk of impact. To put that in perspective, this figure is double that of even the previous DJI drone. The pro model features even more advanced sensors, but there is certainly little reason to complain about what you do get here. Then there is the controller to consider. This component of the drone keeps things pretty sleek, with a minimalist design, and a mount for your smartphone, from which you view things from the perspective of the drone. 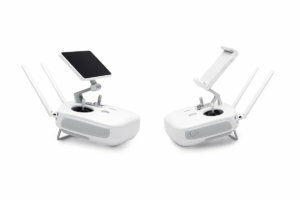 In terms of actual dimensions, the DJI Phantom 4 Advanced Drone manages to fit their features into a compact package. It measures 16.7 x 13.3 x 9.3 inches and weighs just three pounds. Certainly, this is slightly bigger than many drones that are out there, but it also does considerably more. All in all, the design does not depart very much from what we would expect to find from a drone of any price range. Now that you have an understanding of this drone’s design, let’s further explore the product by looking at some important features. The Phantom 4 Advanced really kills it with battery life. You get about 30 minutes of fly time here. Of course, that figure does not account for problematic conditions that drain battery life quicker, such as high winds. To put this number in perspective for you, the average flight time is probably somewhere around ten minutes. Really great drones often come closer to the twenty-minute mark. Thirty minutes is about as good as you can expect to see. The nice thing is that it also charges up pretty quickly. An hour of charging will get it back up to full battery, at which point you can enjoy another thirty minutes of flying. Another really remarkable aspect of this drone is simply how quickly it can go. The Phantom 4 Advanced can go a staggering 44 miles per hour. To put that in perspective, most drones that can be found at the consumer level go about twelve. Really good drones that are more in line with the Phantom 4 Advanced price category are lucky if they are going thirty. Granted, there is no obvious reason for the average user to need this much speed, but it can be fun to have. The active tracker makes it easy to keep track of your targets. This is actually an automated mode of use. That means that the drone will pretty much fly itself. For as fun as it is to zip around and control the device on your own, the Active Tracker will do a better job of keeping your target in focus. There are actually three ways to use this mode: trace, profile, and spotlight. The trace mode follows behind the subject. Profile and spotlight both allow you to follow a subject with a more angled approach. Of course, for many buyers, the camera is what matters the most. As you would imagine for the price you do get a really great camera here. The 20MP camera is capable of shooting video at 60 frames per second and produces high-quality images and video. You are, of course, also able to adjust the settings of the camera to your own specifications for more customized results. Ultimately, the camera leaves nothing really to complain about. You certainly get what you pay for with this unit. As we see it, shoppers encounter this drone’s biggest problem up front. 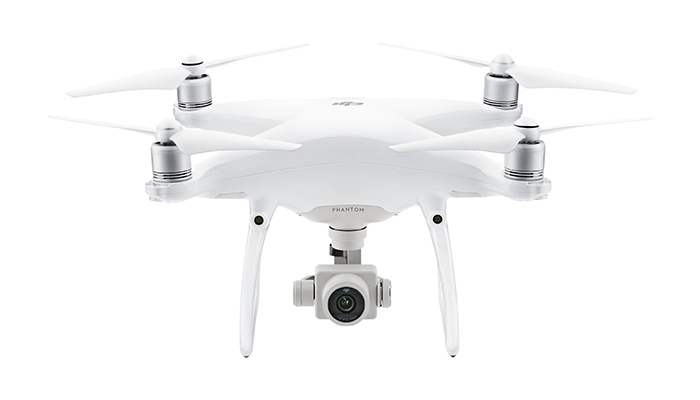 The price tag will preclude budget buyers from taking the DJI Phantom 4 Advanced home with them. Those with money to spend, however, might find themselves with plenty to consider. The remarkable speed, the top of the line battery life, and the excellent camera all make for a product that stands shoulder to shoulder with some of the best options on the market. There is no questioning the quality of the DJI Phantom 4 Advanced drone. Value is the only matter that you may find yourself struggling with.